Welcome to Black Hills Towers, LLC. We are a company dedicated to quality workmanship and customer satisfaction. 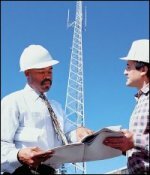 Our personell have experience in the Cellular, Microwave, AM, FM, and Television Communications fields. We have worked for a broad range of customers; including Government Agencies, Law Enforcement Agencies, Utility & Power Companies, Broadcast Companies, Major Wireless Companies, and Microwave Companies. During this time we have performed work on many types of structures -- Guyed Towers, Self-supporting Towers, Monopoles, and Wood Telephone or Power Poles. We have, also, completed specialized installations on Rooftops (Public, Government, Historical), Water Towers, and Bridges. In order to prevent injuries or work delays in this often times fast-paced, time-driven industry, safety is of major importance. We at Black Hills Towers, LLC, are proud of our safety record and will continue to place emphasis on Safety & Rigging Training. Thank you for visiting us online. If you need more information or would like to contact us, please click here.